HIGH FIVES ALL AROUND. 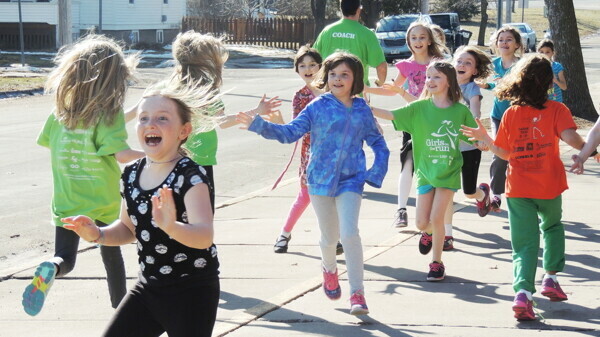 More than 1,000 third- through fifth-grade girls from local schools have taken part in the Girls on the Run of Eau Claire Country program since its inception in 2006. If you’ve ever trained for a 5K race, you know the “high” you get when you cross that finish line. Pre-teen girls like Madeline and Eva are learning about that power of running along with valuable life skills and more by committing to training two nights a week for 10 weeks during late winter and early spring through Girls on the Run of Eau Claire County. The organization is a local independent council of Girls on the Run International, which has a network of 200-plus locations across the United States and Canada. 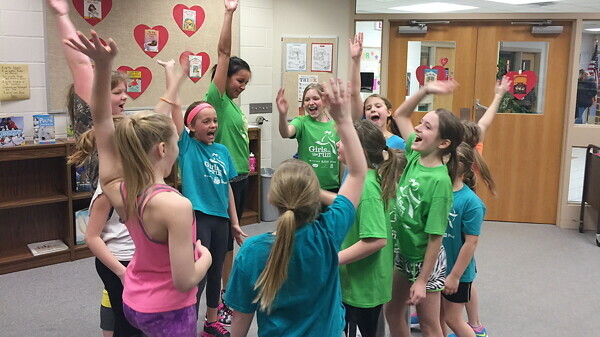 “Girls on the Run has helped me meet other girls and helped me feel better about myself. … I like knowing that there are other girls wanting to achieve a goal of running in a 5K race, and the coaches have fun ways to exercise.” – Madeline, third grade, Locust Lane Elementary School, Eau ClaireAimed at preteen girls in the third through fifth grades, the program combines training for a 5 kilometer (3.1 mile) running event with 20 fun, experienced-based lessons that teach self-confidence, independence, and teamwork to small groups of 10 to 15 girls. Specially trained volunteer coaches who also have passed background checks lead the program. Girls on the Run of Eau Claire County’s eighth annual 5K race is set for 10am Saturday, May 9, at Owen Park. Girls on the Run of Eau Claire County currently serves elementary schools in Altoona (Pederson), Augusta, Eau Claire (Flynn, Lakeshore, Locust Lane, Meadowview, Montessori, Northwoods, Putnam Heights, Robbins, Roosevelt, and Sherman), Fairchild, Fall Creek, and Osseo, and has a waiting list. 3. Just in time for its 5K race on May 9, distributing more than 250 free pairs of running shoes with neon-colored laces to interested participants at its first ever “If the Shoe Fits … Run” event held recently at the Eau Claire Sports Warehouse thanks to support from the Eau Claire Marathon, eBay Gives, Scheels, Charter Bank, and Youth Leadership of Eau Claire. To learn more about Girls on the Run of Eau Claire County, visit www.gotreauclaire.org or www.facebook.com/GOTREC, email girlsontherunec@gmail.com, or call (715) 271-7703.